Presenting - Mobile Check-in! Works on any mobile device (at least the ones that people are actually using ;) that has geo-location services. Although it was a relatively simple set of changes, we still ran into enough 'gotchas' that made the project linger longer than we both wanted. It's still just a web app, so the person doesn't need to install anything on their phone (because frankly, they don't want to have to install a church app on their phone -- they've already got their Bible app, so what more do they really need?) Seriously, I've mentioned this topic at previous RefreshCache events -- many others balk at the idea writing separate apps for iPhone, Android, Blackberry, etc., and even though there are frameworks/tools that will let you more easily build a native app wrapper around your HTML "app", I still say "people don't want to install your app." With the coming HTML5 storm coupled with changes by vendors to allow web apps to have the same access to hardware that native apps enjoy, I feel stronger than ever with my argument. Once you're on campus, if the event's check-in start time has started you can check-in using your phone number. In the future, it would be nice to automatically access the devices mobile number directly and try to find a matching family first, but for now it's still better than waiting in line to use a public kiosk. Major props go to Jason because he did a sweet job taking our existing module's markup and making it look amazing using his mad CSS styling magic skills. July 9, 2012 at 11:48 AM This looks really nice, Nick! One thing that isn't clear is how you are handling printing... are you only using this for check-ins where you don't need to print tags, or do you have a centralized "get your tags here" for these mobile clients? No, we're definitely printing labels. We have two approaches when it comes to labels. For most of our cases (normal children's weekend and VBS) labels print in the location/room. For the other cases where the system is configured to print at the "[kiosk]", the mobile devices have their labels printed via the physical (or virtual) kiosks to which they are **mapped (-- but even in this case that physical kiosk simply provides the defined printer name to which the print job will be sent.) In all our cases, our printers are network printers. We no longer use USB/parallel-port printers attached to kiosks. ** our new code uses an Arena lookup to 'bind' a lat/long coordinate to a defined physical/virtual Arena kiosk. 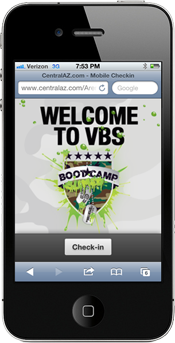 Update: At one of our campuses we had 50% of the 1163 kids (580 to be exact) check in using this mobile, non-native, web-app! At that campus we checked in one kid every second during that first, peak minute. I'll blog all the details and metrics next week. July 13, 2012 at 11:09 AM Nick, How can I get a copy to start testing on my end? Also, it's still certainly an Arena Module. In the future, it will be a Rock Block for the Rock ChMS system (www.sparkdevnetwork.com).